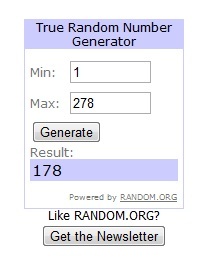 Winner of My Giveaway Announced! First off, I want to say a huge thank you to everyone who participated. I truly appreciate all your support of this blog and myself. Once again, a huge huge very sincere very big-hearted thank you to everyone who entered. I will be hosting a few more mini-giveaways to celebrate all you lovely readers - so watch this space! If I don't get a reply by then, I'll re-draw the prize and announce a new winner.